with the loss of power. 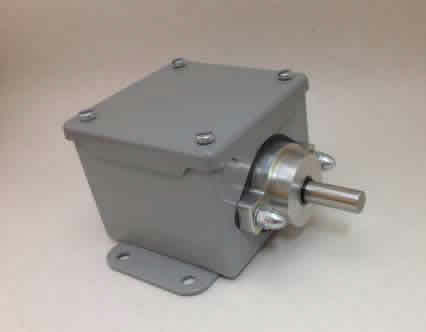 Typical applications for this sensor include Dancer Position, Accumulator Position, Slide Gate Position or any application requiring position feed back. The teachable sensor is mounted in a steel housing that is constructed from 16 gauge steel and is designed to meet the requirements of NEMA 12. This high quality position sensor has an accuracy of +/-0.35° (+/-21 arc-min). Quality components, precision and modular construction all combine to produce dependability, simplified installation and competitive pricing. To set the output range of the sensor, simply rotate the shaft to the minimum position and press the Low Limit Switch for 2 seconds. Rotate the shaft to the maximum position and press the High Limit Switch for 2 seconds. The unit is now calibrated for 0-10VDC out from the minimum to maximum position.